I’m not one to make grand resolutions for New Years, but I do want to do two things in 2010 — get some more miles under my feet and keep exploring parks that I’m a regular at. Friday I did a little bit of both with a 7.6 mile hike around the snowy and slushy trails of South Mountain Reservation. NOTE: The above map and route was made with RunKeeper Pro, a GPS based activity monitor for the iPhone. One of the nice things about the trails in South Mountain is that its easy to orient yourself based on the slope of the ridge and the nearby roads making it difficult to be lost for long and easy to wander from trail to trail. This is just what I did once I crossed South Orange Avenue into the northern half of the park. Jumping from the green trail markers to orange back to green as the terrain or pretty wintery scenes caught my fancy. Finally coming back to the yellow [Lenape] and white trail markers for the walk back to the Locust Grove lot in Millburn along the water. For the first day of the new year the traffic on the trails was light and peaceful. The usual mix of families and dog walkers stuck to the areas around Hemlock Falls, the Dog park, and the larger parking areas, but the trails felt like they were all mine. A wonderful way to kick off a fresh year. How did you spend this first weekend of the 2010? 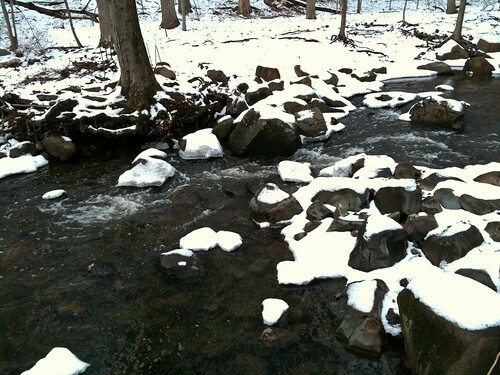 This entry was posted in Trip Report and tagged gps, hiking, new jersey, new years, nj, resolutions, route, south mountain reservation. Bookmark the permalink.